Most interested parties suggested that, after putting in a disciplined shift for the majority of the game, North Korea Women eventually lost out to the USA yesterday due to their telling lack of experience – they have the youngest squad at the World Cup, with an average age of just 20 – though not NK’s coach, who chose to pillory an altogether more ‘atmospheric’ scapegoat. 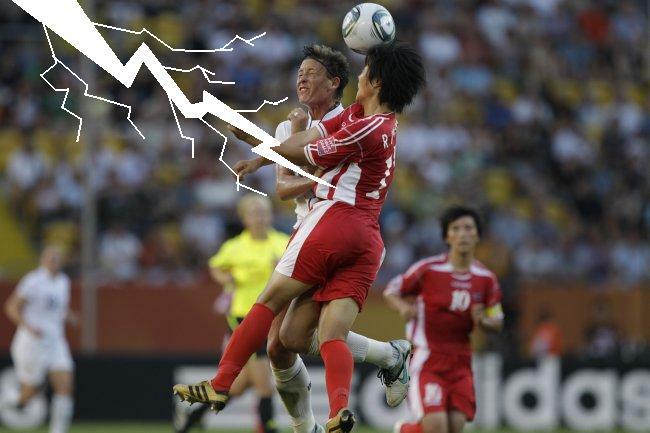 For you see, Kwang Min Kim has blamed his side’s 2-0 loss to the US on several of his players getting struck by lightning in the build up to the tournament – claiming that ‘more than five’ (six? seven? why you no be specific?) of his squad were hospitalised with electrocution after a training match on 8th June. “Some stayed in hospital and then came to Germany later than the rest of us. The goalkeeper and the four defenders were most affected, and some midfielders as well. The physicians said the players were not capable of participating in the tournament, but World Cup football is the most important and significant event for a footballer, so they don’t want to think about anything but football. …or the lingering threat of being exiled to work in the salt mines for the rest of your remaining days. Or…Kwangy is a big, fat liar. That’s an absolutely shocking lie. i heard they poo clouds. Thunderous applause for that pun, Benji. I’m fairly sure one of Kim jong il’s claims is that he controls the thunder and the lightning, if so could this be a bold cry for help? Seeing as how Dear Leader controls the weather, this all seems a bit implausible….